The number one cause for foundation problems in the Jackson Area is from	improper drainage around the foundation. Also, because of the make-up	of the Yazoo Clay in our area, it has as much potential to allow the building	to heave (or rise up) as it could settle. Therefore proper drainage is	important around a building. 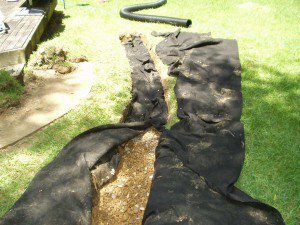 Most drainage problems result from improper grading. Grading is the slope	of the yard. In general terms, a properly graded yard should slope gently	downward from the house and toward the street and alley, so that all rain	falling on the house and yard follows the slope away from the residence. Additionally, many yards that were once properly graded develop problems,	as growing trees and bush root systems create natural dams by raising	the adjacent earth. Many flowerbeds are covered with mulch and pine bark	each year. As these materials decompose, they naturally add a small amount	of dirt to the level in the flowerbed. 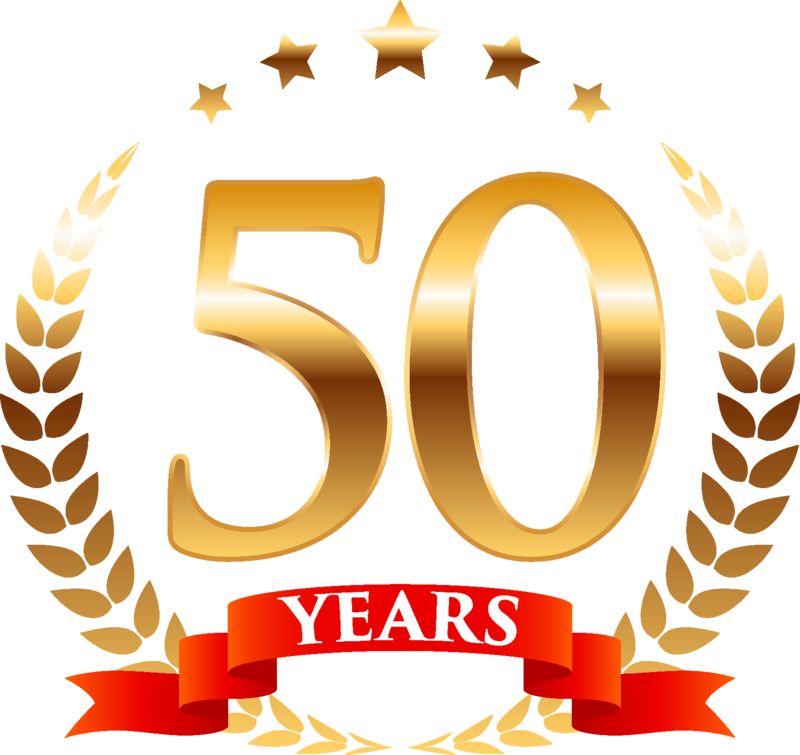 Over a number of years, the buildup	of earth can cause water flow to change, and create a drainage problem. Additionally, well-meaning landscaping projects may also re-slope areas	of the property and create low spots, or even cause water to flow toward	the house. Also, there can be some underground water or subsurface water that affects	the foundation of the residence. This could be an effect of water ponding	around the foundation or in an area uphill from the building, soaking	in the ground and causing water to pond at the foundation of the building. But there’s one question we need to ask first. IS IT SURFACE WATER OR SUBFURFACE WATER? RE-GRADING THE YARD. 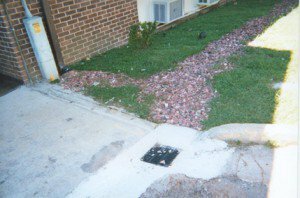 Since most drainage problems are caused by an improperly	graded yard, changing the grade of the yard or the grade of a section	of the yard might solve the problem. However, because of the expense and	disruption involved, re-grading the yard is usually an impractical solution. SURFACE DRAIN SYSTEMS. Surface drain systems consist of a number of drains	installed at the low points in the yard. Each drain is actually a removable	grill covering a catch basin. The removable grill, which keeps out most	large debris, opens to allow catch basin clean-out. Four-inch or six-inch	sloped drainpipes connect each catch basin to adjacent catch basins, and	finally to a discharge point. CHANNEL DRAINS IN CONCRETE. Sometimes there is a use for a surface drain	in an area where concrete exists. The solution for this is to install	channel drains to catch the water in a PVC channel and discharge it in	an acceptable area. 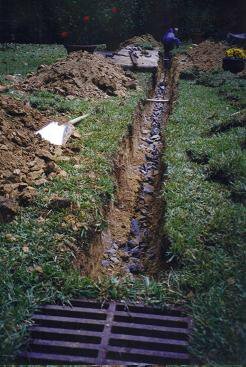 French Drains and J Drains are examples of subsurface drains. These drain	systems are used when water is getting under the structure and causing	increased moisture content in the soils which cause the clays to expand. This expansion of the clay is known as a heave. The remedy for a heave	is to address the drainage problem that is causing the higher moisture	content in the soils.